In contrast to the somber tone of Rosh haShanah and Yom Kippur, the third feast is a time of pure joy. The time of introspection and searching now make way for the feast called; "The season of our rejoicing." The Feast of Tabernacles or Booths: The name comes from the Hebrew - Sukkot; meaning - tabernacles, booths. It comes from the command in (Lev 23:42-43). The impermanent leafy shelters were to remind the Israelites of God's faithfulness during their forty years of wandering in the wilderness. The tabernacles symbolized man's need to depend on YAHUVEH for His provision of food, water, and shelter. The command to build tabernacles and dwell in them coincided annually with Israel's final harvest of the season, and so the name "Feast of Ingathering" was used of the holiday as well. We see this being applied to the feast in Lev 23:34; Deut 16:13. The emphasis is on the relationship to the holiday to the final gathering of the crops in the fall. Ancient Israel's economy was agrarian. The seasons guided Israel's activities. Each season's plentiful harvest brought a renewed sense of relief and thankfulness that they would not go hungry for YAHUVEH had once more provided for His people. It is this feast which provided the Pilgrims with the Biblical foundation for the first Thanksgiving observance. The impact of the holiday upon the Israelites was so significant that the feast of Tabernacles came to be known as the "Feast of the Lord" or more simply "The Feast." The Hebrew word behind the term feast is "Hag" in fact means to dance or to be joyous. It was the high point in the yearly cycle - it was the feast. 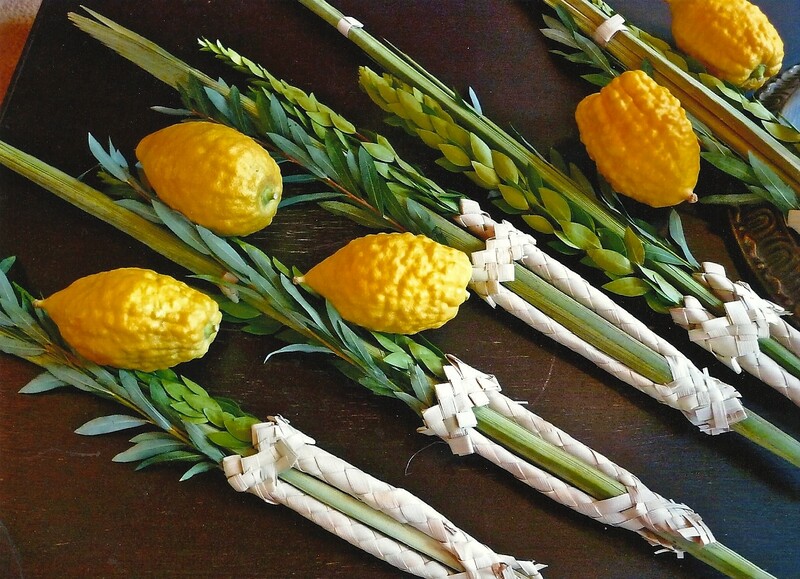 What exactly were the Jewish people commanded to do during the seven days of Sukkot? The building of Tabernacles. The Israelites were commanded to gather bunches of boughs (or Lulavs) to wave before YAHUVEH and build leafy tabernacles in which to dwell for seven days. Living in tabernacles was a reminder not of an unsettled time in the wilderness but, of the sustenance, care, and protection given by YAHUVEH in the desert. The prophet Isaiah reflects this attitude in (Is 4:6). The foliage reminded the Israelites of their humble origins and of the way YAHUVEH cared for them. The tabernacles were a reminder that YAHUVEH would shelter His people and give them food as long as they were obedient to Him. We read in (Deut 16:13-14) the key aspect of the Feast was rejoicing in YAHUVEH. In contrast of Yom Kippur and Rosh haShanah, Sukkot was to be a time of rejoicing. The Israelites were to rejoice in YAH'S provision for their daily bread and their spiritual lives. The Jewish people were not required to go up to Jerusalem for the feast of Rosh haShanah or for Yom Kippur, but they were required to do so for Sukkot. Jerusalem was dotted with thousands of lean-tos. We see in addition to the commandments of building tabernacles and rejoicing before YAHUVEH; two customs had been added to the celebration by YAHUSHUA'S time. The Mishna describes a major ceremony of Sukkot, called the Ceremony of the water drawing - in Hebrew called - Nissuch Ha-Mayim, and is rooted in the agricultural nature of the feast. Rain was a prominent feature in the celebration of Sukkot. The water-drawing ceremony was a joyous occasion. The Levitical priest would draw water from the pool of Siloam in a special golden pitcher. He would be joined by a crowd of people who would return with him to the Temple - through the water gate. As the priest arrived - shofars would sound and he would pour the water on the great altar. The ceremony of the water-drawing held a significance much deeper than the agricultural implications. The rain represented the RUACH ha KODESH, and the water drawing pointed to that day, when according to the prophet Joel, YAHUVEH would rain His Spirit on Israel (Joel 2:28). This ceremony took on an even greater meaning when YAHUSHUA attended the feast in (John 7:37-39) and proclaimed that He would quench the thirsting of the soul. Another ceremony of the Feast of Tabernacles was the Illumination of the Temple. At the end of the first day of the feast, the priests and Levites went down to the Court of the Women. Four golden candlesticks were set up in the court with four golden bowls placed on them - and would be lit. The light emanating from the candlesticks was so bright that the Mishna says; "There was no courtyard in Jerusalem that was not lit up with the light" (Sukkah 5:3). The mood was very festive, people would dance well into the night holding torches and singing songs of praise to YAHUVEH. The meaning of the lights was to symbolize the Shkhinah Glory of YAHUVEH that had once filled the Temple. Again this whole ceremony took on a new and greater meaning when YAHUSHUA stood in the Temple (John 8:12) and declared that He was the Light of the world, for in Him dwelt all the fullness of the glory of YAHUVEH (Col 1:19). In YAHUSHUA we see the fulfillment of the feast of Tabernacles (John 1:14). YAHUSHUA is God tabernacling among men. It is interesting to note that the word "dwelt" implies a temporary dwelling - a sukkah booth. The prophet Zechariah writes of a celebration of Sukkot in the future. YAHUVEH deems this feast as so important that the Gentile nations are commanded to observe it as well - (Zech 14:16). In Jewish sources Israel's role in world redemption is a major theme. In commenting on (Ps 109:4) it is said; "At the festival of tabernacles we offer up seventy bullocks (as an atonement ) for the seventy nations, and we pray that rain will come down for them." Israel is considered a nation of intercessors for the sins of the Gentiles. The prophet Zechariah spoke of the end of days, when Israel and the nations would together celebrate the feast of Tabernacles. This day of restoration will take place after the time of Jacob's distress (Jer 30:7), or in the New Covenant, the Great Tribulation (Mat 24:21). Israel will be restored, both spiritually and nationally. Her enemies will be crushed, and YAHUSHUA ha MASHIACH will reign, not over Israel alone but over all the nations of the earth (Zech 14:9). YAH will command the faithful among the Gentiles to come to Jerusalem and celebrate the Feast of Tabernacles (Zech14:16). Why did YAHUVEH choose the Feast of Tabernacles, and not one of the other major festivals, as a test of obedience for the Gentiles? Some scholars believe that Sukkot, as the feast of ingathering, is the most appropriate time for God to gather the human fruit for His kingdom. Ultimately, the whole earth will become the sukkah booth of YAHUVEH, and He will reign for all eternity (Rev 21:3-4). A sukkah must have at least three walls--the fourth side may be left open. The walls of the sukkah may be of any material (metal, wood, canvas, brick or stone). They should be firmly fixed so as not to be easily blown down or flap in the wind. A sukkah constructed adjacent to a permanent house may count one or more walls of the house as its own walls. A sukkah may be small, suitable for only one person to sit in; or it may be large enough to accommodate hundreds of people. The "temporary" quality of a sukkah is in the roof or the ceiling. That which may be used to construct the ceiling of the sukkah is cut off from the ground qualifies, as long as it is not subject to ritual impurity, which excludes fruits. Otherwise, branches cut from trees or bushes, cornstalks, two-by-fours, bamboo reeds, and sticks all qualify as kosher skhakh. When put on the sukkah, these must be loose and not tied in bundles. Poles, sticks, branches, etc. not only qualify as skhakh but may also serve as appropriate supports on which to place smaller, more decorative types of skhakh such as tree branches or boughs of evergreen leaves. Sufficient skhakh must be put on the roof so that more shade than sunlight is provided. Some air space in the skhakh is desirable so that the stars may be visible through it on a clear night, although the sukkah is kosher and not disqualified if the skhakh is too thick for that. One should, however, be careful that no opening between the skhakh provides an empty space wider than ten inches (three tefahim). On the other hand, the skhakh must not be so thick that in case of rain it serves as a protective covering and prevents the rain from dripping in. This would disqualify the sukkah. The skhakh must always be put on after the walls are completed and never before, so that the sukkah is completed with the putting on of the skhakh. A sukkah built under a tree or under some permanent roof such as a porch is invalid and disqualified. A permanent overhang that extends over a sukkah for more than seventy-two inches or six feet also disqualifies the entire sukkah. However, the entire sukkah is not disqualified if the overhang is less than seventy-two inches or six feet (arba amot). Even so, the area under the overhang itself is not considered part of the sukkah and one should not sit there. It is proper and even praiseworthy to decorate a sukkah to make it inviting and cheerful, pretty and pleasant. It is customary to hang different fruits from the skhakh, to hang pictures and decorations on the walls, and to put up decorative tapestries. The involvement of the whole family in the building and decorating of the sukkah can make it one of the more exciting and eagerly awaited occasions of the year.